Can I travel internationally on Aztec with an ESTA Visa? Yes, Aztec is now a signatory carrier to the U.S. Department of Homeland Security Visa Waiver Program. When traveling to the US with ESTA Visa, you must purchase a round trip, non-refundable ticket. How soon before the flight do we need to “check in”? On scheduled flights you need to check in no later than 60 minutes before the flight: on charter flights we prefer to have you available 30 minutes before flight time to confirm your travel documents and to ensure an on-time departure. Scheduled flights leaving Fort Lauderdale Executive airport will depart from the Flight Center Flight Academy (click here for address), and in North Eleuthera, your flight will depart from White Crown Air Services at the North Eleuthera airport. At Governors Harbour you will depart from the international terminal at Governors Harbour airport. 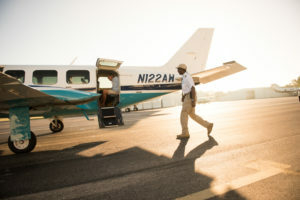 When you book a charter flight, your charter sales representative will make arrangements for the location of your pickup and drop off FBO (or ‘Fixed Base Operator’) at the airport of your choice. Can I park my car at Fort Lauderdale Executive Airport? Complimentary parking is available when you arrive at the Flight Center Flight Academy. We will provide you with a parking pass when you check-in. Can your aircraft pick us up somewhere else? 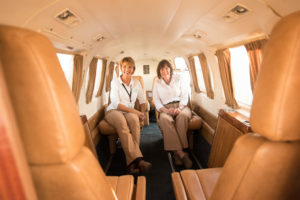 Charter passengers can be picked up anywhere in the Bahamas or in Florida, or anywhere in the Southeast United States for that matter. Contact your charter sales representative to find out your available options. How much luggage can we bring with us? We recommend limiting yourself to no more than 35 pounds of luggage, and soft sided luggage is always easier to transport and load on board our aircraft. First 35 pounds free. Over 35 pounds: $2 per pound space permitting, with a $10 per bag surcharge for large/oversized bags. Contact our reservation agent if you wish to combine passenger transportation with cargo transportation. For flights to Eleuthera, be sure and ask about our combined cargo flights with TWINEX, where your overweight luggage and cargo inbound to Eleuthera can arrive at the same time as you do! Is there a bathroom on board the planes? No we are afraid there is not. Our scheduled flights are under two hours, so be sure and ‘go’ before you ‘go’, and try not to drink too much water on board until more towards the end of the flight. Can Aztec Airways fly me from one island to another? Unfortunately, no we cannot. 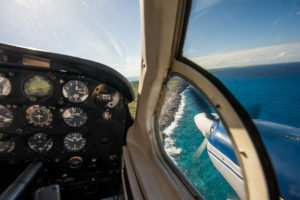 International aviation regulations prevent a United States air carrier from flying you inter-island; check with our charter sales representatives to see if we can make arrangements for a Bahamian air taxi to move you in between islands. I have cargo to transport, to where do I deliver it? Can I bring my surfboard? How about my scuba diving stuff? We can bring your surfboard but only under special arrangements (and additional costs) for the regularly scheduled passenger flights. Most likely it will have to be sent as cargo, but don’t worry we will take very good care of it for you. We recommend you make arrangements for a personalized charter if you are going to carry your surfboard. With regards to scuba equipment, we are glad to take your scuba diving equipment but the scuba tanks will have to remain behind. Be sure and leave the weights behind too and rent them when you get there! Why do I have to give you all my personal information? Government regulations! Seriously, to enter and leave the country we have to provide the US customs and border protection service with very specific information regarding your identity, passport information, date of birth, etc. etc. We can’t board you on an international flight or bring you back into the country without it. Will you serve me food on the plane? Can I bring my own? No, we do not serve food on our scheduled flights, other than bottled water. Considering that our flights are under two hours, we really have no accommodation for you to bring your own food on the flight either, other than small snacks, baby formula, or something to keep the kids busy. On customized charter flights, speak to your charter sales representative about making arrangements for in-flight catering, we will be happy to accommodate those requests. Will it be scary riding on those planes? No, it’s a lot of fun! Flying in our fleet of Pipers is a great experience and it gives you an unparalleled opportunity to see the islands the way they were meant to be seen, from above! Our professional and knowledgeable crews are happy to answer any of your questions about the unfolding beauty of the Bahamas from the air. Are there items that I can’t carry with me? Yes-anything that would be considered Hazardous Materials. That means that anything that may leak chemicals, that could contaminate the air, pressurized gas cylinders, or anything that would be flammable or could catch fire. If you have any questions about anything you may have in your luggage or on your person be sure and asked your airline representative if it’s safe to travel with aboard our aircraft. This is a serious matter folks, and there are severe federal penalties for violating the Hazardous Materials rules on board aircraft. Will someone look inside my baggage or my purse? Remember, that you will have to clear Customs both in the Bahamas on your way out and in the United States on your way back, and the Customs Service on either side will more than likely look inside each and every bag you carry with you. The airline also reserves the right to look into your luggage or your personal carry-ons, with you present, as a means of ensuring the security of other passengers. Will we fly through the “Bermuda Triangle”? The ‘Bermuda Triangle’ is a mythical section of air and sea that some say have mysterious powers, but our pilots and our aircraft have been flying through this area for many, many years and are still waiting to see something mysterious happen. You shouldn’t expect anything on your flight, but if you see something interesting or mysterious, be sure and let us know! I am a “plus-size” person, is this a problem? Usually this is not a problem, we carry the normal seatbelt extenders on board our aircraft. If you feel you have extra special needs be sure and contact us in advance and we will do our best to accommodate. Are there any extra fees and costs? All fees and costs are represented in our ticket prices except a $29 departure tax that must be paid to Bahamian Customs prior to leaving the islands. There are added fees on scheduled flights for excess baggage, pets, taxes, and additional services. There is also a small convenience fee charged by the reservation software company for booking directly online. This information is on our online ticket sale portal, we want to make sure you have no surprises. On custom charter quotes, all fees and charges unless otherwise represented or are unknown, are included in the charter quote. My kids are small, do I need to buy them their own seat? Children who have not reached their second birth date may be held on a parents lap. Children can ride in a separate passenger seat, in a car seat, provided the car seat has the following notation in red lettering as part of the seat: “THIS RESTRAINT IS CERTIFIED FOR USE IN MOTOR VEHICLES AND AIRCRAFT”. Can I use my cell phone or laptop in-flight? How about my Kindle? You may use any of these devices provided the ‘airplane mode’ is switched on prior to departure. This is for your safety and the safety of others. Check with your flight crew for the use of any other portable electronic device for their permission. Pet Fee: under 10lbs: $25. 10-30lbs: $100. Pets over 30 lbs: Please call us to purchase a seat. The pet will accompany you in the cabin during your flight. Will I get airsick? What if I do? Try and keep your tummy full before a flight. Flying on an empty stomach is not a good idea. If for some reason you feel discomfort from choppy air, all aircraft have a ‘sic-sack’ at the ready for your use. There is a group of us traveling together on a charter flight, can we all pay separately? No! Unfortunately, US Department of Transportation regulations preclude group charter passengers from paying separately. We must receive payment from a single payee. Is it appropriate to tip our pilot? We are in the service business and as in any other the recognition for outstanding service or exceptional effort is always appreciated.